For a clean and clear skin! Deep clean is the skin exfoliation technology that allows a deep cleansing and a skin rejuvenation. The device is equipe with a probe that supplies corundum crystals that act on corneum stratum and soflty eliminate the impurities and blackheads, the soft abrasion stimulates the tissue regeneration and the local micro circulation. Deep clean in a short time makes a deeper cleaning than the cleaning with vapor. 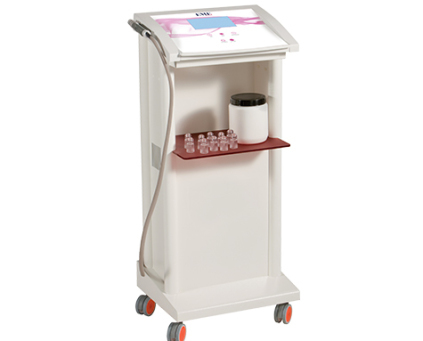 If used with higher power, the skin rejuvenation is stimulated and the micro circulation of treated areas is improved. During the treatment the there could be a redness that will disappear after a few hours. Deep clean allows a skin exfoliation that can be used by all beauty salons and qualified aesthetic and medical centers. The technique of Deep clean uses the corundum crystals (one of the most powerful abrasive minerals found in nature) that are supplied to the area to be treated thanks to a pen fitted with a perforated disposable hood. In a fast but accurate way, the operator passes the probe over the face and/or body to be treated. During the passage, the corundum powder is supplied on tissue, that is massaged and exfoliated. The suction allows the re-absorption of the crystals together with the abraded skin and driven into the dumping tank. The use of the device require a simple manual skill of the operator and is pleasant for the patient. To abotain a successful treatment it is important that the hood perfectly adheres to skin.